This week we will continue to work around our afghan with some fun textural stitching… Don’t worry… The next few rows are easy and I have some pictures for you to guide you!!!! And, I will be asking you to count your stitches at the end of your rows… This will be very important to keep your afghan in a nice even rectangular shape!!! *Tip: It will be very important to count your stitches and write down how many you have top, bottom and both sides. You should have the same “even” number of stitches on the top and bottom… and the same “even” number of stitches on the Right and Left sides. *Tip: When working on Row 3 using the Twisted Stitches, make sure you are using all the stitches by double checking your stitch count. So if you have 94 Hdc stitches on the top from row 2,,, You will have 47 Twisted Stitch Sets or 94 Trc that cross over each other in pairs. See picture below. Row 3: Ch 4(Counts as Trc now and throughout), Trc in Previous stitch to create a Twisted Stitch Pair. ( See Picture 2). * Skip next stitch, Trc in next stitch, Trc in Previous stitch(skipped stitch) to form Twisted Stitch Pair. Repeat Twisted Stitch Pairs across to corner. 5 Trc in corner space*. Repeat * * around to past last corner. 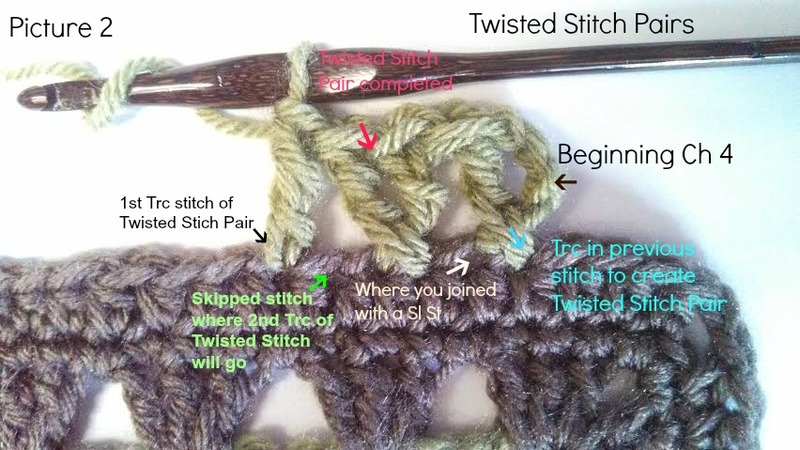 Continue with Twisted Stitch Pairs until you reach the beginning Twisted Stitch Pair. Join to top of Ch 4. Finish off. Row 4: With Neutral Color join with Sl St in any stitch. Ch 2 (Counts as Hdc), Hdc in each stitch around, Making 3 Hdc’s in the center stitch of each corner, (this will be in the 3rd Trc stitch in the previous round). Join with Sl St to Ch 2 and finish off. * Make sure your stitch count has the same number of stitches on the top/bottom and also the same number of stitches on the right/left. 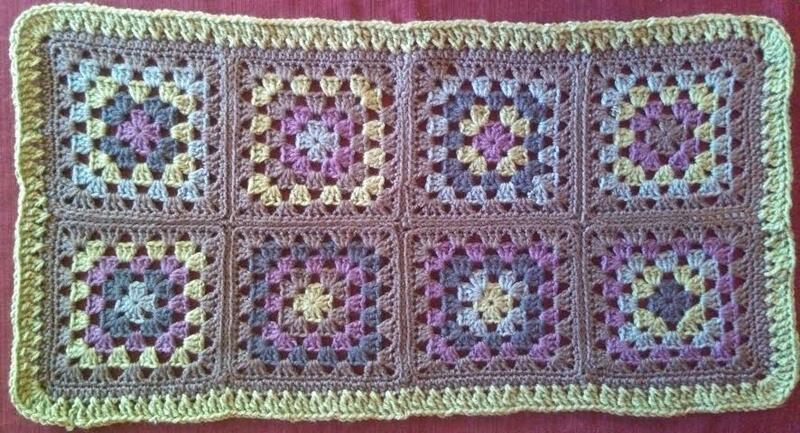 This will be important to keep the afghan in an even rectangle. Row 6: With Neutral Color, Join with Sl St to any stitch. 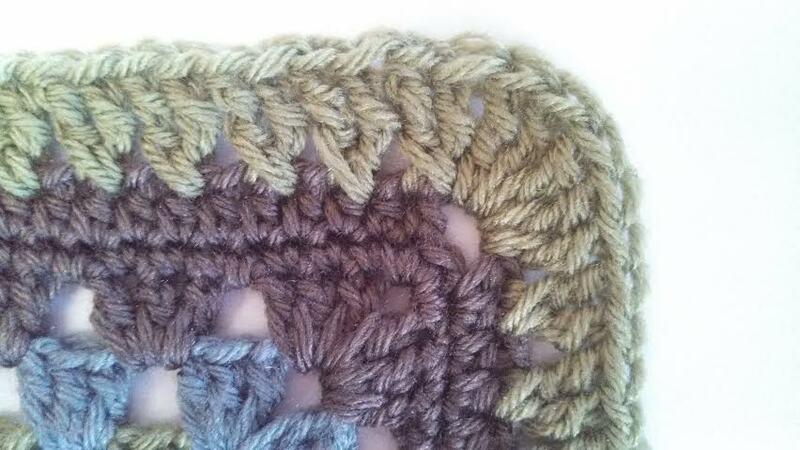 Ch 2 (Counts as Hdc),* Hdc across to corner stitch (This will be the 2nd Trc in corner from Row 5), 3 Hdc in corner St*. Repeat* * around to beginning Ch2. Join with Sl St to Ch 2. finish off. You now have completed Week 3… Congratulations!!!! I hope you love your afghan to this point… Next week we will be using some new stitches and having some more fun!! Hoping to get caught up this week!!! I love the “X” stitch and can’t wait to get it going! Hi! I am loving this CAL and can’t wait to see it done. 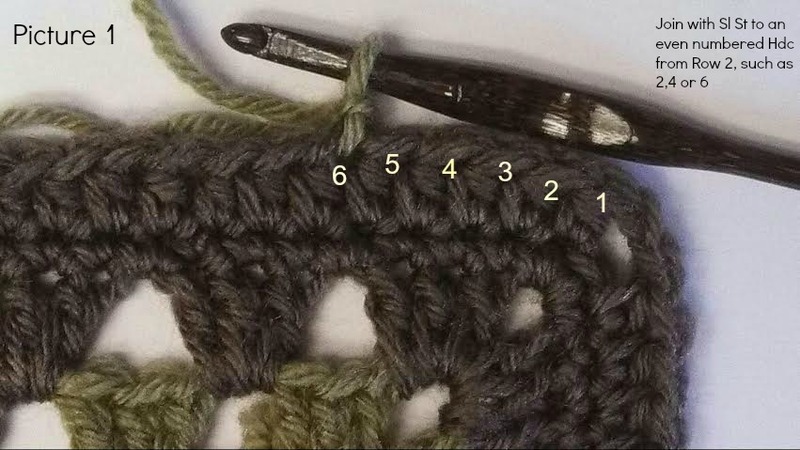 Just a question… Row 4 has 3 hdc’s in center stitch of corners, row 5 says 3 trc’s in corner space. Which space is that? Am I reading it wrong? Sorry for the dumb question. No problem… This will be in the 2nd hdc in the corner from the previous row…Another words… the middle stitch of each corner.. Hope it helps… I added that explanation to the pattern… Hope it helps! Thank you so much for organizing this CAL. Yay… I am glad you like it… I hope my tutorial helps!! Thanks so much for week 3, awesome stitches. Here is my work thus far. Have a great one!